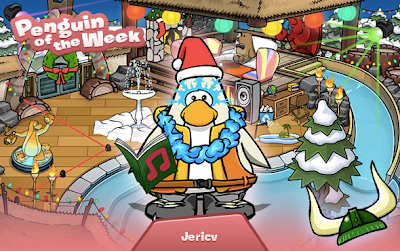 Club Penguin Cheats by Mimo777 Club Penguin Cheats by Mimo777: Penguin of the Week: Jericv! He got a green viking helmet and 10,000 coins to spend for being the POTW! Rad! People now get items for being POTW? Wow, that must stink for people who were POTD instead since they probably didn't get the free item.